Each day kids see their parents go to work – whether they work in their own business or work for someone else. It’s very different to watch your parent start a business. I had no idea what that really meant until I watched my dad start his own business during the 1983 recession. I remember Dad securing a warehouse stall, setting up office space in our basement, buying a truck and other equipment, calling an insulation manufacturer to order product, earning customers, getting insurance, and so many other necessary things to start up a business. Even with all this going on, life seemed to operate as usual. He never let my sister or me see just how stressful it must have been to start out or how scary it must have been to leave his job and venture into brand new territory. What Dad did let us see was a lot of hard work and determination – exactly what it takes to create a successful business. We saw him get up early to install insulation and bid jobs, then sit in the office after a long day of physical work to prepare proposals, pay bills and collect money. In these early days there were no assistants or employees – just Dad. 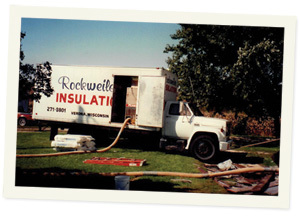 We did lend a hand where we could – unloading semitrailers and riding along on weekends while dad blew insulation into attics. Many times we would stop at a job site to do a bid on the way to a family gathering or other event. Life as a child of an entrepreneur was never boring. I know that time had a profound impact on my own work ethic and I wouldn’t trade it for anything. I don’t know if all those years ago Dad thought a one-man and one-truck operation would grow into what it is today. I do know he did everything he could back then to make it happen! I know how proud I am to be his daughter and to help him celebrate 35 years in business.